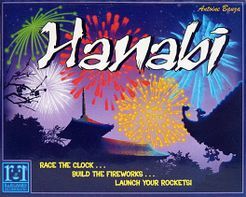 Buy Hanabi and PriceWatch, Buy this board game at the Lowest Price. Each player is dealt 4 or 5 cards (depending on the number of players in the game) that you hold face out so you can't see your cards, but everyone else can. Each player then has 3 options to take on their turn: tell someone else about one or more of their cards, play a card from their hand to the table in hopes that it adds to a firework, or discard a card and return. If you give someone information about a card (color or number) you must point to all the cards of the same type, "You have two 4's", "These three cards are Green". You can give a clue about color or number, not both. It is then on the player to remember what has been identified, but if they forget the other players can remind them of things they should know about a card – as long as they play fair. When you do this you place one of the blue 'info' tokens on the tabletop into the game box. There are eight tokens to start the game and believe me, they get spent quickly. Read on to see how to get those tokens back into play. If you play a card to the table you want it to be the next number available for whatever suit it happens to be. All the suits are in play at the same time and you don't have to know which suit you are playing from your hand, but it helps. Before any cards are played to the table, if someone points to one of your cards and says it is a one then you know it's safe to play since it is obviously the first card in any suit. If it doesn't follow this rule (it is a green four and the green suit only has one and two played into it) then you are one of three steps closer to losing. You have to take one of the fuse tokens and throw it into the box. If you are well into the game and all the fireworks have been started (there is at least a one on the table for each suit) and someone has identified a card as a one, then you should feel free to discard that card on your turn. This benefits you in two ways; it gets you another usable card from the draw pile and more importantly it returns a blue info token to the table which enables more clues to be given out later. The game ends when one one of three conditions. The last fuse token is exposed, in which case all players lose. All fireworks are completed 1-5, this is the best possible win condition. The last card is pulled from the draw pile, in which case all players get one more turn then the number of cards played on the table is totaled and degree of victory is determined. After you have the core game figured out, throw in the included expansion of multi-colored cards and have fun with the game all over again. It's great when you play a game that you think is excellent. It's better when you don't need to get anyone elses opinion because two days later it wins the 2013 Spiel des Jahres (Germany's "game of the year") award. The game is well thought out. There are more ones in the deck for each suit (3 of each) which makes it more likely to get the game started since they are needed to initiate a firework. There are 2 of each of the other cards, except for fives since they can't make the game too easy. This keeps the game from grinding to a halt when you erroneously discard a card you need. You are even allowed to go through the discard pile whenever you'd like so you can easily keep track of the state of the game. If you accidentally discarded both green twos, then you know you don't need to bother with green threes, fours or fives.